The new HD Pentax D FA* 50mm F1.4 SDM AW created quite a splash upon its release. This long-awaited lens, which was a long time in the making, is supposed to represent the best optical performance attainable on K-mount. The D FA* 50mm F1.4 is the second digital star lens around 50mm, the other one being the SMC DA* 55mm F1.4 SDM. This second lens is part of the DA line, meaning that in theory its image circle only fits APS-C. However, the 55mm has been proven to work well even when in full frame mode. 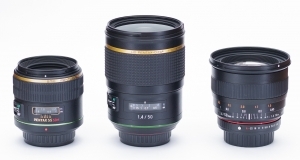 There is no shortage of 50mm lenses on the market, although most rely on older designs. One exception is Samyang's 50mm F1.4 AS IF UMC lens (also sold under the Rokinon branding). Announced in 2014 and available on a variety of mounts, this manual focus lens carries a favorable reputation. The K-mount version presents the advantage of offering automatic aperture control and metering, a feature lacking on some other mounts, as well as an aperture ring. 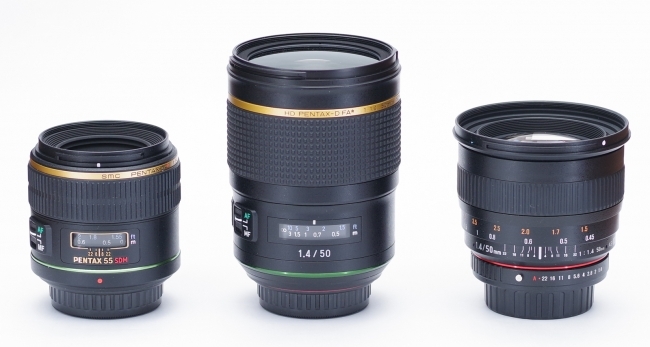 These three lenses represent some of the best glass available around 50mm on a Pentax full frame camera. All three offer maximum apertures of F1.4 and reportedly excellent image quality. With the release of the D FA* 50mm and in light of its favorable review, the question arises: how does it compare to its DA* predecessor, and to the competition? In this comparative review, we will take a look at the physical properties and optical performances of the three lenses. Read on to find how the Pentax D FA* 50mm, Pentax DA* 55mm and Samyang/Rokinon 50mm compared!